Heavy fishing gear can completely crush the delicate skeletons of the sponges. Fishing gear also churns up mud and sand from the seabed creating sediment clouds that smother the sponges. This prevents the sponges from getting the oxygen and food that they need to survive and grow. Glass sponges are very slow growing – it is estimated that a 1m tall sponge may be 220 years old 2 and a patch of reef may take hundreds of years to recover from damage, if they ever recover at all. For many years, conservationists, fishermen, scientists, and the Canadian government have been working together to protect the reefs by creating a marine protected area within which no harmful activities will take place. Unfortunately, scientists believe that by the time the reefs were discovered in 1987, fishing activity had already destroyed half of them.1 Bottom trawling fishing boats drag huge nets weighing up to two tonnes along the seafloor, crushing and catching everything in their path, leaving only rubble and clouds of sediment behind. Weighted prawn and crab traps drop to the seabed like bombs, leaving craters where they land. The fragile silica skeletons of the glass sponges have the texture of baked meringue (or a prawn chip if you prefer savoury), and so are easily crushed by even minimal contact. Maps of the areas targeted by bottom trawling fishing show the black scars of their “tracks” right over the glass sponge reefs.1,3 Fishing boats unknowingly targeted the reefs, causing great damage. It makes sense that the sponge reefs are good fishing grounds for prawns, rockfish, halibut, and cod because they provide such good habitat for them. It is also for this very reason that the reefs need strong protection – they are important for maintaining healthy populations of many sea creatures that many of us depend on for food and jobs. When this happens glass sponges can send electrical signals that stop feeding (similar to how our nervous system tells us to hold our breath underwater). In the short term, this stops the sponge from choking on sediments and helps them to survive.4 If the activity stops and water clears, the sponge can start feeding as normal in about 6 hours. However the sponge has effectively “skipped a meal” and lost some much needed energy. If activities that stir up sediment clouds happen often the sponges could stop feeding for so long that they begin to starve, slowing their growth and ability to reproduce. If activities that re-suspend sediment continue for long periods of time scientists believe that the sponges will eventually die of starvation. Because the sponges rely on water currents to feed, scientists have estimated that if a sponge is exposed to sediment when the current is at its peak, it will reduce the amount of food they can consume by 2/34, so instead of three meals a day the sponges only get to eat breakfast. 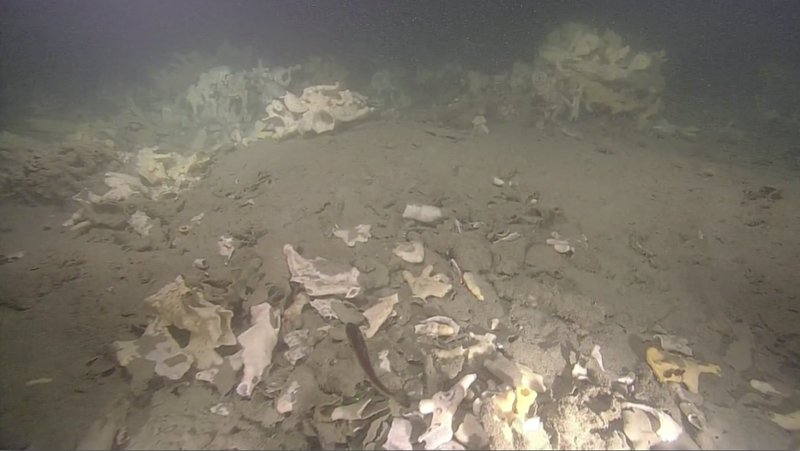 BC’s glass sponge reefs are incredibly rare, ancient and important ecosystems. The Hecate Strait and Queen Charlotte Sound Marine Protected Area provides these reefs with permanent protection, prevents further damage and ensures the reefs can remain a source of awe and wonder for generations to come. A core protection zone immediately surrounding the reefs and stretching 40 metres above the reefs. The core protection zone will provide strict protection for the reefs, no fishing or laying cables will be permitted. A 150 metre wide adaptive management zone that would circle the reefs. According to the draft regulations, bottom trawling, cable laying and anchoring of vessels will be allowed in the adaptive management zone. The vertical adaptive management zone which extends from 40 metres above the reefs to the sea surface. The draft regulations allow midwater fisheries, including midwater trawling, to continue. Over the 30 day comment period the government of Canada received feedback from thousands of people, including a letter signed by 40 international scientists stating that the risks were simply too great to allow potentially harmful activities like trawling, anchoring, and laying cables to occur in the adaptive management zones. 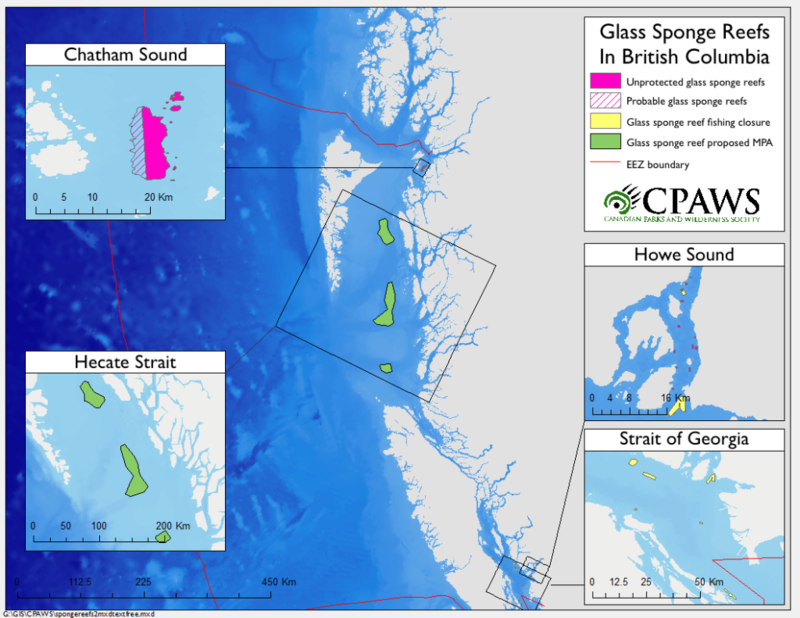 Conservation groups were thrilled to hear Canada’s glass sponge reefs were fully protected on February 16th, 2017 in the form of a Marine Protected Area. The Hecate Strait and Queen Charlotte Sound Glass Sponge Reefs Marine Protected Area was announced by Minister of Fisheries, and the Canadian Coast Guard, Dominic LeBlanc. Making the glass sponge reefs a marine protected area (or MPA for short) means that all uses of the ocean over and around the reefs are assessed and all potentially harmful activities are properly managed according to a comprehensive management plan. The MPA prohibits all bottom contact fishing activities from occurring within at least 1 kilometre of the reefs, until it can be proven that activities are not harmful. Additionally, Fisheries and Oceans Canada will implement more stringent measures for midwater trawl fisheries through fisheries closures. CPAWS is pleased to see the Government of Canada take the necessary steps to improve the protection of the reefs and congratulates the government for taking a much more precautionary approach to conservation. 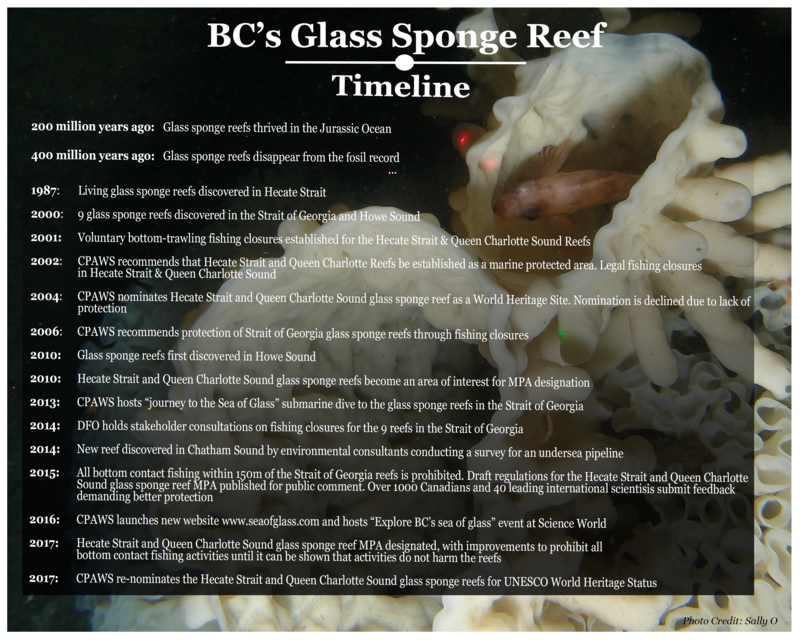 To see a timeline of the glass sponge reefs, including discovery and protection, click here! Show your support for BC’s Sea of Glass and send a letter of thanks to the Minister of Fisheries and Oceans Canada for protecting our glass sponge reefs.